Mosaic art work of the Chinese symbol for happiness. 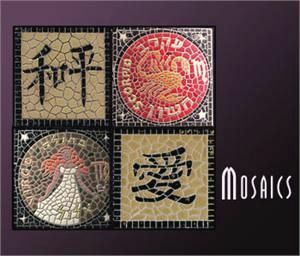 Mosaic art work of the Chinese symbol for love. Mosaics decoration was first used many centuries ago. People from all over the world loved and decorated their floors, walls and places of worship with the small, wonderful, colored cut pieces. It was the Greeks, in the four centuries BC, who raised the pebble technique to an art form, with precise geometric patterns and detailed scenes of people and animals. By 200 BC, specially manufactured pieces ("tesserae") were being used to give extra detail and range of color to the work. Using small tesserae, meant that mosaics could imitate paintings. Its representation as a man pouring a stream of water out of a jug came about, it has been suggested, because in ancient times the rising of Aquarius coincided in the Middle East with a period of floods and rain. Its representation as a crab (or lobster or crayfish) is related to the crab in Greek mythology that pinched Heracles while he was fighting the Lernaean hydra. Crushed by Heracles, the crab was rewarded by Heracles' enemy, Hera, by being placed in the heavens. It is represented by a woman (sometimes identified with Astraea, the Roman goddess of justice), holding a balance scale or by the balance alone. Mosaics decoration was first used many centuries ago. People from all over the world loved and decorated their floors, walls and places of worship with the small, wonderful, colored cut pieces. Its representation as two fish tied together is usually related to the Greek myth of Aphrodite and Eros , who jumped into the river to escape the monster Typhon and changed into fish, or, alternatively, the two fish that carried them to safety.Mosaics decoration was first used many centuries ago. People from all over the world loved and decorated their floors, walls and places of worship with the small, wonderful, colored cut pieces. It is represented either by a centaur shooting a bow and arrow or by an arrow drawn across a bow. The Babylonians made the identification of Sagittarius as a mounted archer as early as the 11th century BC. Mosaics decoration was first used many centuries ago. People from all over the world loved and decorated their floors, walls and places of worship with the small, wonderful, colored cut pieces. Its representation as a bull is related to the Greek myth of Zeus, who assumed the form of a bull to abduct Europa.Mosaics decoration was first used many centuries ago. People from all over the world loved and decorated their floors, walls and places of worship with the small, wonderful, colored cut pieces. It is represented as a young maiden carrying a sheaf of wheat. She is variously identified as a fertility goddess (the Babylonian and Assyrian Ishtar, among others) or the harvest maiden (the Greek Persephone and others). Mosaics decoration was first used many centuries ago. People from all over the world loved and decorated their floors, walls and places of worship with the small, wonderful, colored cut pieces. Mosaic art work of the Chinese symbol for wealth.